I did some Akibaranger rewatching and I ended up coming up with a wild idea. So why didn't Toei set ToQGer as the 40th anniversary season instead of Zyuohger? The reason behind it is that ToQGer is powered by IMAGINATION which reminds me of Akibaranger's Delusion Power. All this may be possible if Naruhisa Arakawa were its main writer. All that Imagination Power in ToQGer could have been used more or less the same way as Akibaranger. In fact, I even think about improving that concept What if a bunch of children who became adults through their IMAGINATION ended up imagining Super Sentai Warriors in suit. 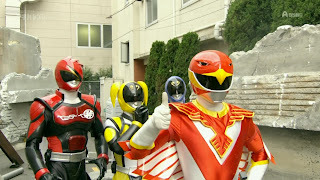 Just imagine it if in the introductory arc we see Right imagine himself into meeting Red Hawk or the other Akibarangers discover the power of the previous Super Sentai. 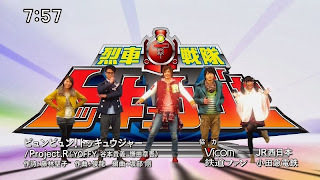 The opening scene could have them as children imagining they are Super Sentai warriors. Then newer train mecha would be based on past Super Sentai powers which they imagine these stuff into life as they battle the Shadow Line. 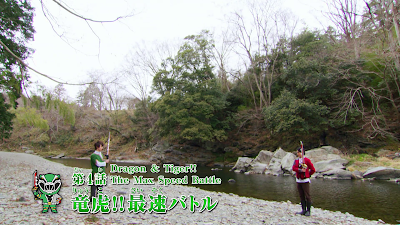 This would probably have some comedic reaction with the Gokaigers and the Ninningers. I remembered Ninninger had a few special guests namely Tsubasa Ozu/Magi Yellow, Sasuke/Ninja Red, Yousuke Shiina/Hurricane Red and Yamaji Touha/Jiraya from the Jiraya Metal Hero series. 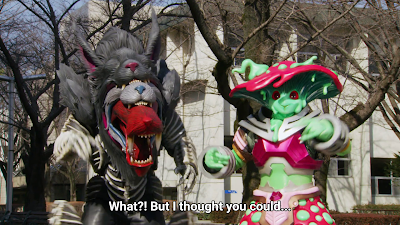 The crossover would probably be funny if the ToQGers could end up imagining the Kakurangers' powers and the Hurricangers' powers to the envy of the Ninningers. If it were a Gokaiger/ToQGer crossover it could also be that funny. I mean, what if they ended up strengthening their imagination so far that the whole Gokaiger continuity bumped into theirs? That's what I'd call your imagination got so strong you brought in one whole show! Shadow Line could end up this way. I would like to imagine what if a group of hammy horror comedy villains were bent on deleting the history of Super Sentai from the minds of children? Another possible thing they do is to take over Imagination Worlds related to Tokusatsu and the ToQGers must free these various Imagination Stations from Shadow Line's corrupt influence. We could get children who get caught in these corrupted stations with different half-brained plans to trap the world's Imagination the shadows forever. Of course, Emperor Zetto can still exist as a Loose Cannon and Large Ham provided he doesn't deviate from Shadow Line's objective. Then put General Schwartz as the Scott Evil of the group who plans to overthrow Emperor Zetto for making nothing more than Dr. Evil type plans to carry out Shadow Line's schemes. What do you think of this what if scenario? Kyuranger 36: Space Balls Lucky? 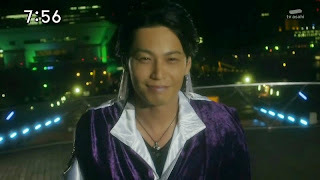 Kyuranger 34: The Mysterious Wrester Is...?